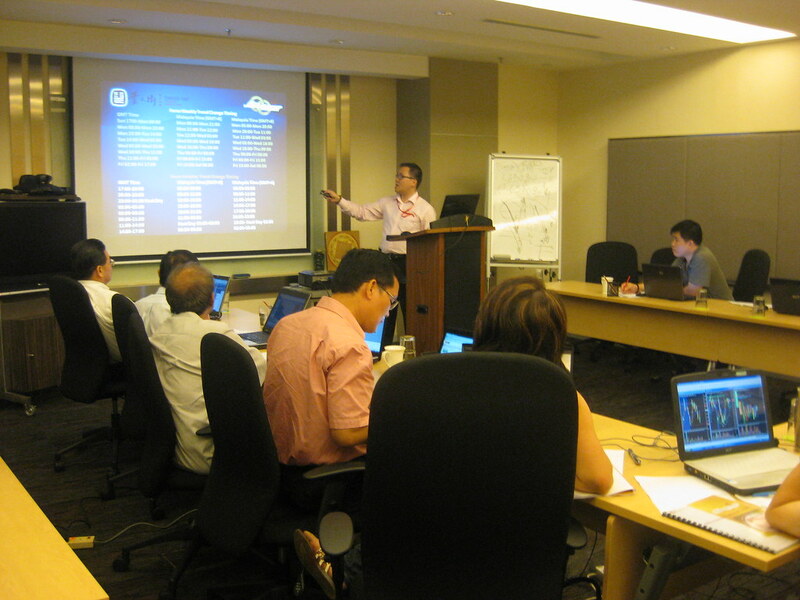 What are the UNIQUE features in Celestial Disc™ Forecasting System that BENEFITS you? You have the unfair advantage as you can forecast the support and resistance price levels of a financial instrument in advanced so that you could buy or sell in the right price levels. You can forecast the trend changing timing in advance, before the trend actually takes place. 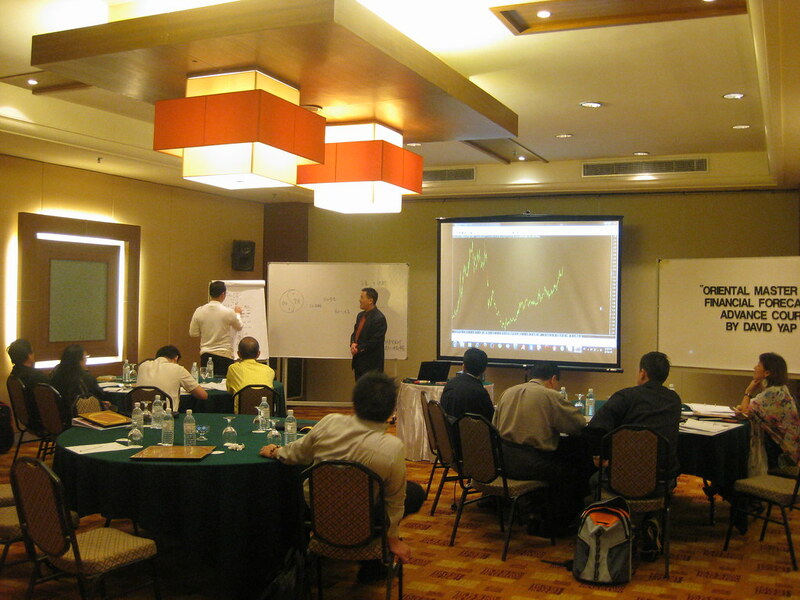 What is immediate support and resistance price levels on the following date? Imagine you could forecast in advance the next intraday support and resistance based on the price today? 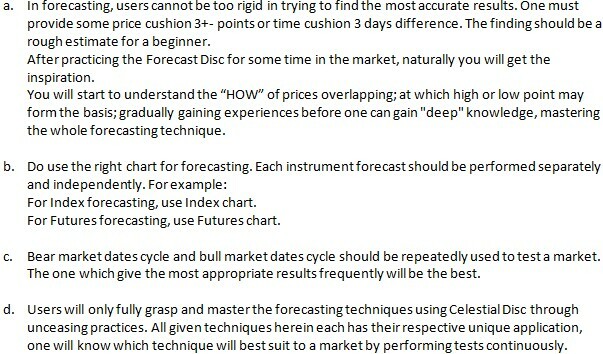 Know Every Stock with Celestial Forecasting Disc! 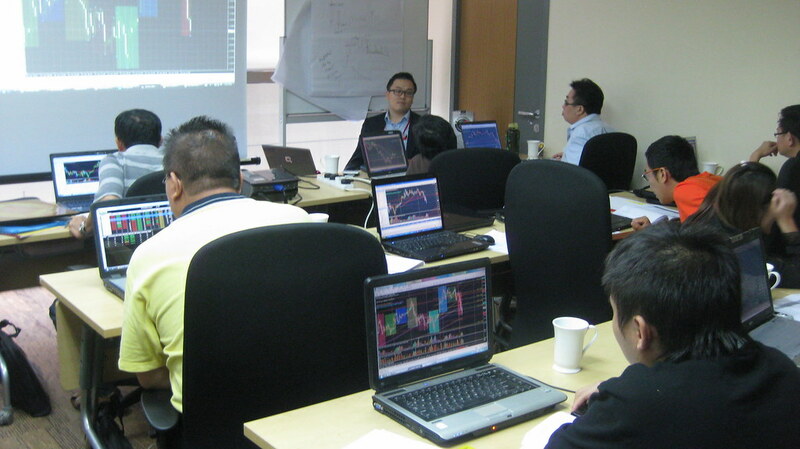 NEVERTHELESS, conventional analytical tools though they are helpful but aren’t sufficient BECAUSE they examine current prices relative to the histories of price movements to understand and plan for what may happen next. 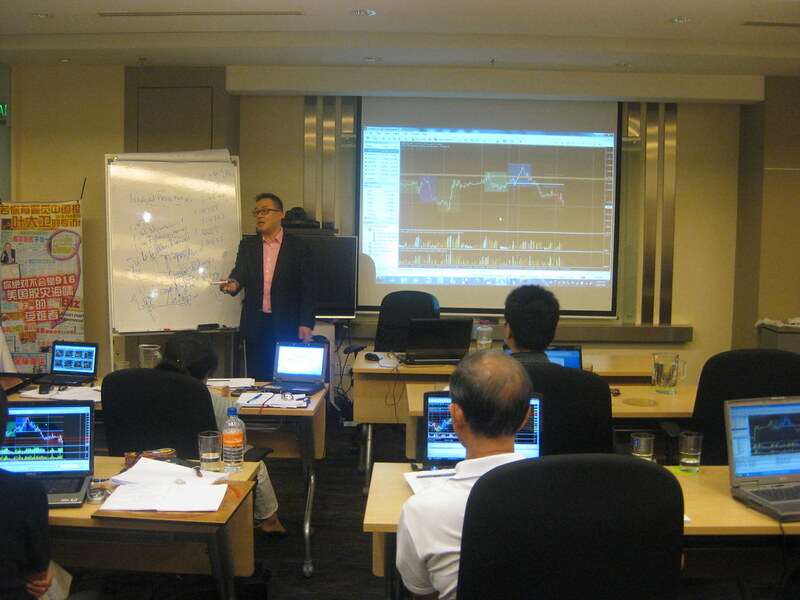 Is There a Way for ME to Become Smart, Successful and Sustainable Investor? 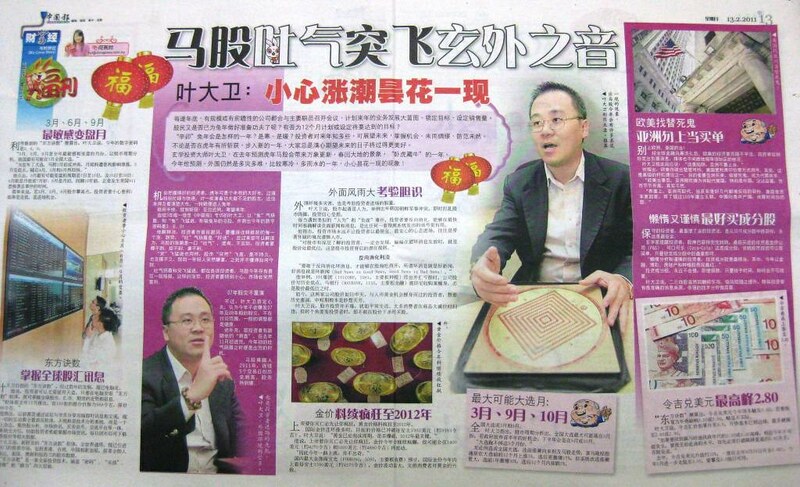 Celestial Forecasting Disc draws out the essence of the ancient wisdom of China philosophical scholars, and applying them to forecast the price and trend on the worldwide financial markets and financial instruments like stocks, forex, futures, options and etc. 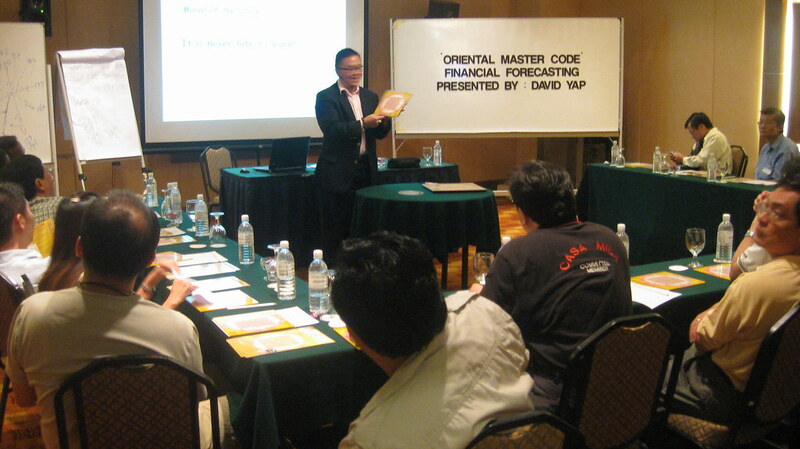 And OMC Millionpreneur™ Forecasting Programme will complement and complete you to be SMART, SUCCESSFUL and SUSTAINABLE investors, creating wealth beyond yourselves as we fulfill our mission to our customers! And OMC Celestial Disc Forecasting Programme is your worthy partner in educating & empowering you to make your dream a REALITY. Know Every Stock with Celestial Disc - Playing the Wall Street Game beautifully! 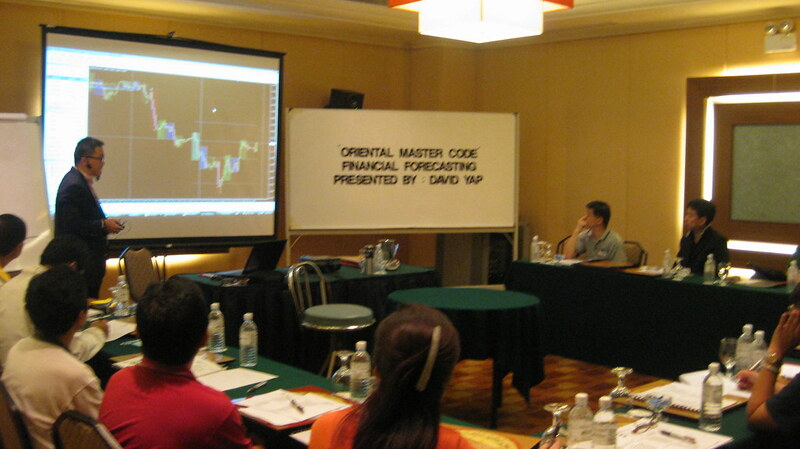 DOMINATE the secret of Wall Street and effectively forecast NOT LIMITED TO Gold, Stocks, Futures and Forex! 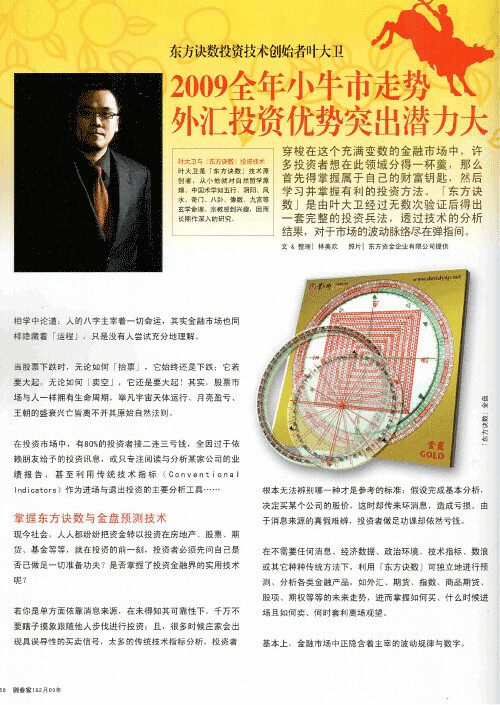 The Celestial Disc is based on Chinese natural philosophy as the core of research, applied into designing and modelling the entire financial "compass". It has been represented by re-emerging the natural philosophy uniquely. It comprehensively interprets the blind spots and myths of various forecast techniques. 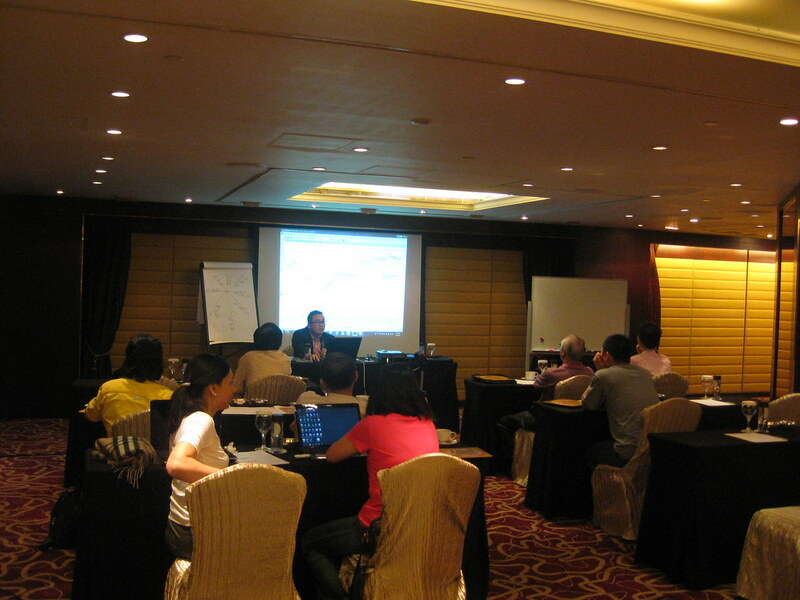 The Forecast Disc is a simple yet effective tool for performing financial market forecast, assist investors to eliminate top crucial personal psychological barriers in investment includes: uncertainty with Entry and Exit, loss of Market direction, anxiety as a result of Losing Money, and so on. Have you SEEN Before: Western’s "Wheel & Square of Nine" vs "The Oriental’s Kalachakra" and "Magic Square Matrix"? The application of “Wheel & Square of Nine” in market forecast originally derived from oriental ancient metaphysics, wisdom and knowledge. 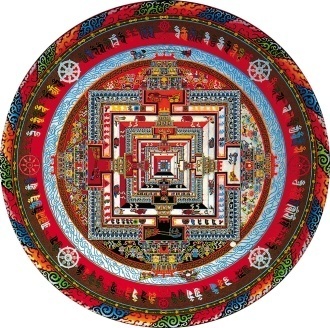 During early time, the ancient Kalachakra as well as ancient bronze coins been widely used throughout the ages. This is the expansion of principle "Heavenly Round; Earthly Square". Therefore, returning its root of source is the ultimate way, where one be able to grasp the essence of entire Forecast Disc. 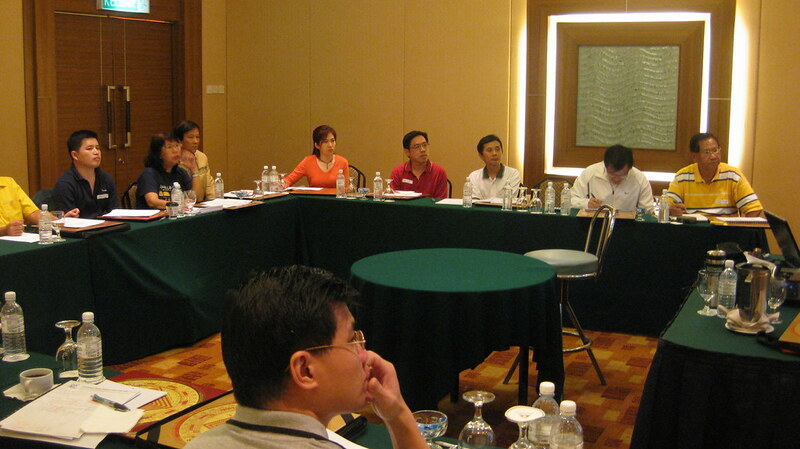 From here, every myths in general application of “Wheel & Square of Nine” will be uncovered. “Heavenly Round” refers to "Time" cycle. 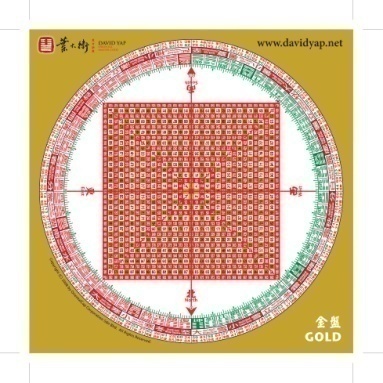 “Earthly Square” refers to the “Space”, represents the prices in the context of financial market. When “Heavenly Round; Earthly Square” and along with you having Forecast Disc (where having you as the superior being to all objects), this combination collectively refers to "Heaven, Men, Earth”（these are termed as “Three Talents” in Natural Philosophy）. 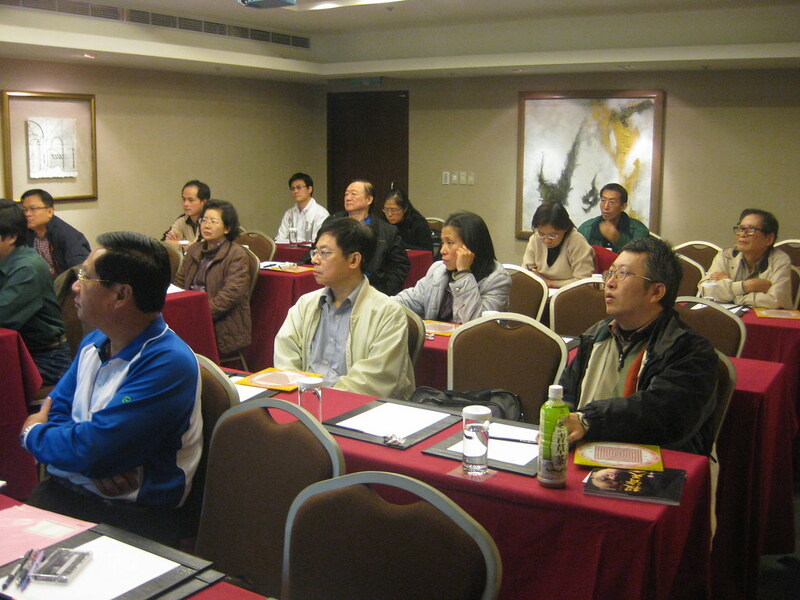 By practicing the rotation and applying Forecast Disc, a natural attraction field (sixth sense) will be developed. 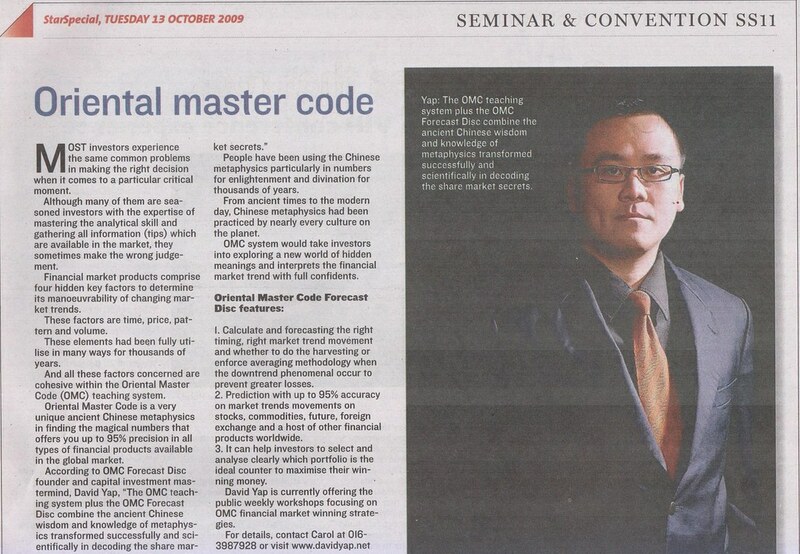 Therefore the Forecast Disc together with oneself subconscious interaction will form hunches of market outlook, what we called as “Human sixth sense”. Square of Nine Number Central part of Forecast Disc consists of numbers in spiral matrix, known as the Number Square of Nine. 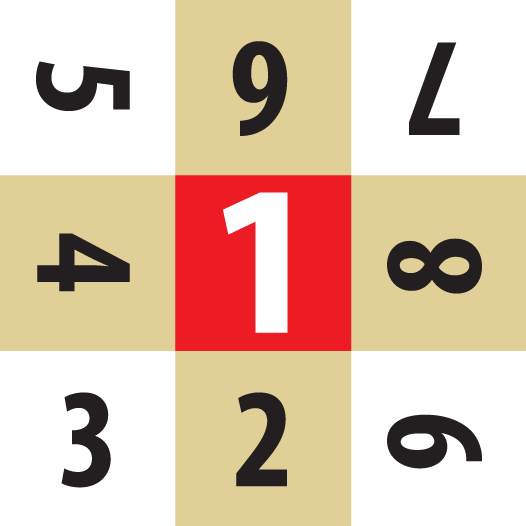 The name Square of Nine Number derived from having the numbers 1 to 9 displayed repeatedly and extends throughout the square. Beginning from center point starts number "1", move North down number "2", move Left to number “3”, move Up to number “4” and “5”, move Right South to number "6", move Right to number "7", down West to number "8", and move Down to number "9". Completing the first spiral ring (level) then move to the next new spiral ring (level), number "10" will be the starting. Please note that this number "10" is actually the number "1" + "0" = "1", hence, starting with number "1", continue to number "11" ( "1" + "1" = "2"), number 12 ( "1" + "2" = "3") and formed increased numerical values of subsequent numbers from variation of number 1 to 9. 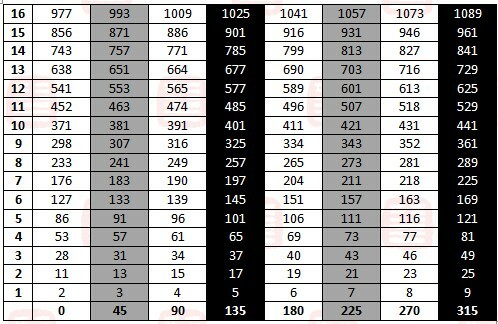 The numbers closely related with numbers 1 to 9, interestingly the maximum number of 1089 ("1" + "0" + "8" + "9" = "18" = "1" + "8" = "9") falls within the law of numbers 1 to 9 as well. 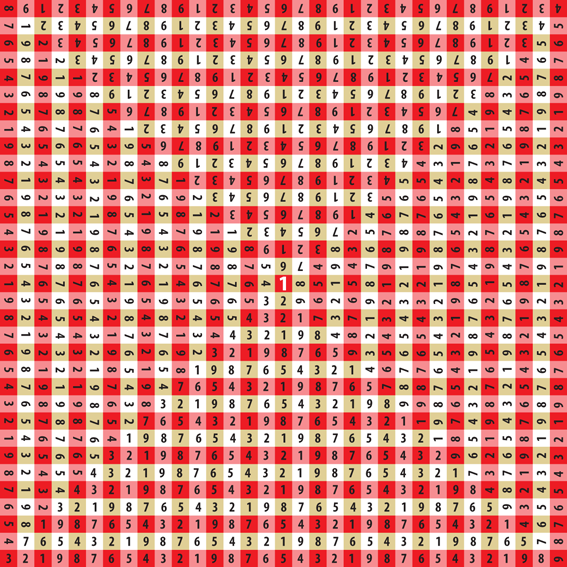 Square of Nine Number Spiral Matrix just like a pyramid. 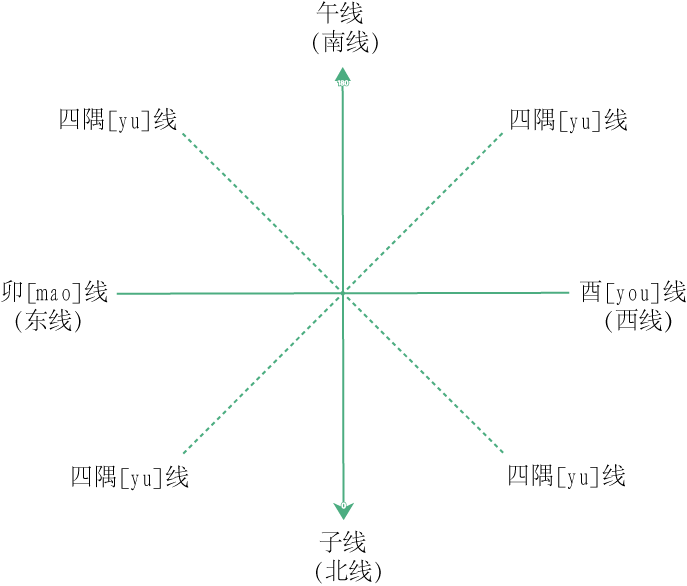 Imagine, the peak of the pyramid is "1" and formed by 1089 pieces of components (Block). Time Cycle maps to the Earth revolving around the sun along ecliptic orbit. ZiWu Line (0 and 180 degree line) is the reference indicator for marking the whereabouts of current ecliptic orbit (position). 8-lines (Four Main Lines, Four Corner Lines) The disc center has 8-lines (Eight Diagram Lines), divides a line in every 45 degrees, this is formed by eight division law. In these 8-lines, each lines has its respective importance and priority order. “Four Main Lines” are the four lines that due east, due south, due west and due north respectively, each at angle of 90 degrees in direction of four main lines. There are 90 degrees due east, 180 degrees due south, 270 degrees due west and 360 degrees (0 degree). Note: The sum of degrees always "9", how wonderful! Number "9" is the largest among numbers. Since degree number of these Four Main Lines are "9" which represents an important status, its influence to market forecast is impactful. Four Corner Lines, “x” is the line of intersection, represents the secondary importance to Four Main Lines. It lies in between, also half of the two Four Main Lines. Their respective directions are Northeast, Southeast, Southwest and Northwest. Numbers in the disc that overlay under these 8-lines are critical support or resistance numbers (price levels) to the market. Four Main Lines, both of them has its respective importance and priority order: First one is ZiWu Line (Meridian line), formed by 0 degrees and 180 degrees lines, Second line is East-West Line (Latitude line), formed by 90 degrees and 270 degrees lines. The 360 degrees divided into 16 sections, every 22.5 degrees into a line, so that builds a total of 16 lines. Out of 16-Lines, 8 of them are the Four Main Lines and Four Corner Lines. The remaining lines are evenly divided between Four Main Lines and Four Corners Lines. Thus, we name it Division of 16-lines. 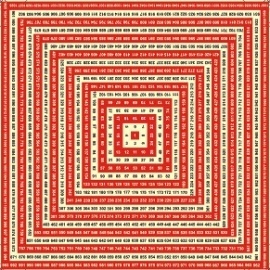 The sum of degrees of all the 16-lines is "9". 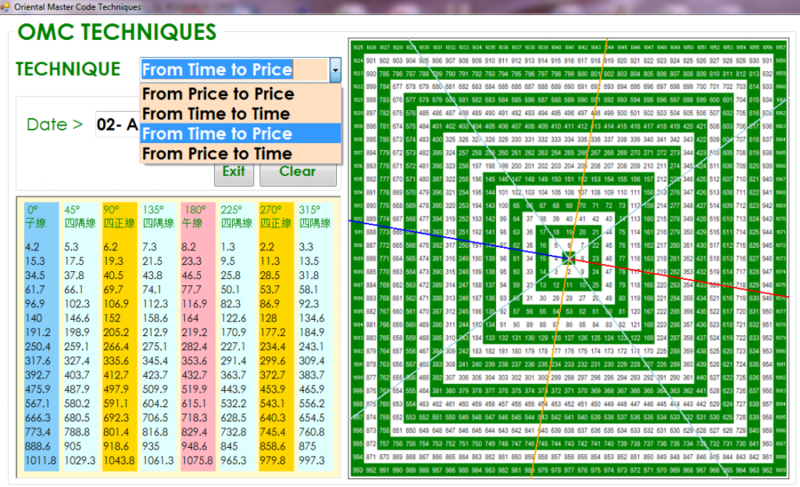 In Spiral Numbers Chart, from 1 to 1089 is sufficient to cover all market prices. The disc may be used in some market Indexes which having more than ten thousand points as well, such as Dow Jones Index of 13,000 points. 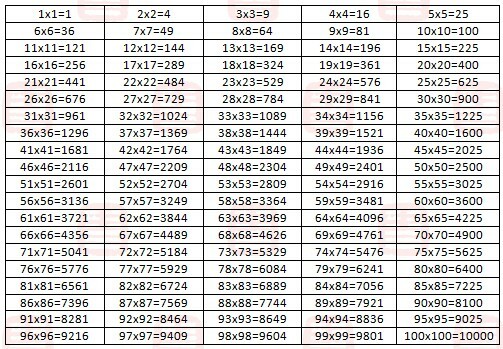 So there’s no need to extend the chart in Square of Nine Numbers into more than ten thousand points. Such act violates law of nature, which also does not conform to natural specifications of Square of Nine Numbers Spiral Chart. Ambiguous situation may appear if incrementing the numbers been performed. 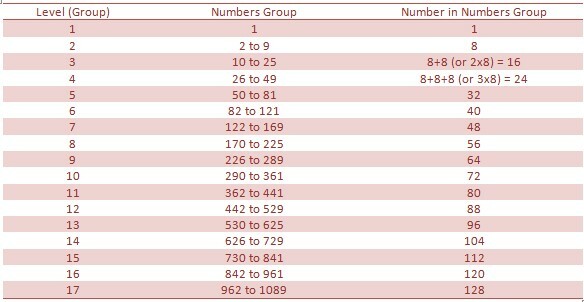 Any number which is above the hundredth (three digits number) will be simplified into three digits or two digits number (to ensure 8-lines principles been adhered so information remain intact). This is an elementary technique for predicting turning point of future price using the preceding high and low price levels. 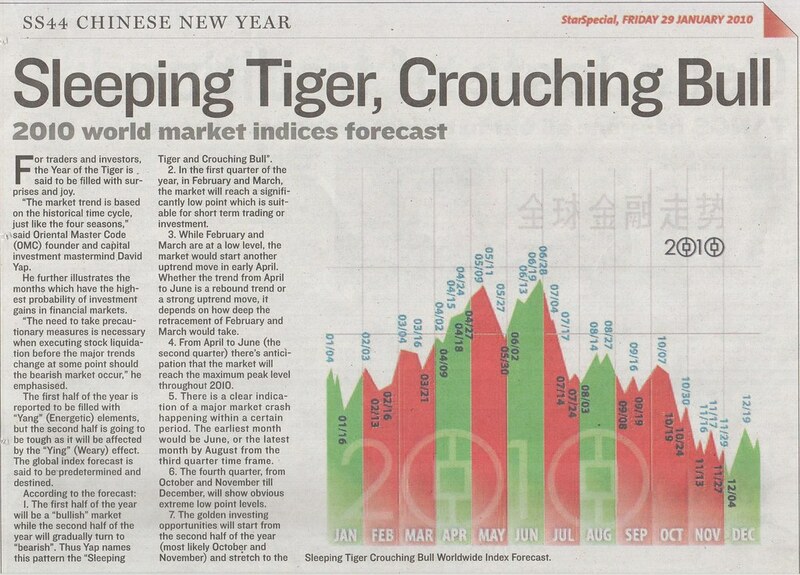 Generally, using extreme high or low to predict its price turning point is the most essential and crucial. What if minor high or low price is used? 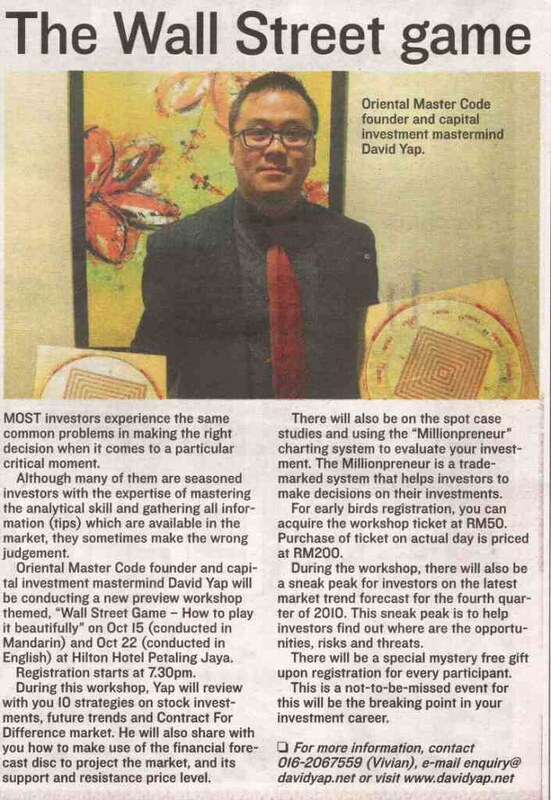 Then its price turning point be categorized as minor important. HINT: When you are not sure about extreme price level, you may use the 52 Weeks’ High/Low price as common practice. 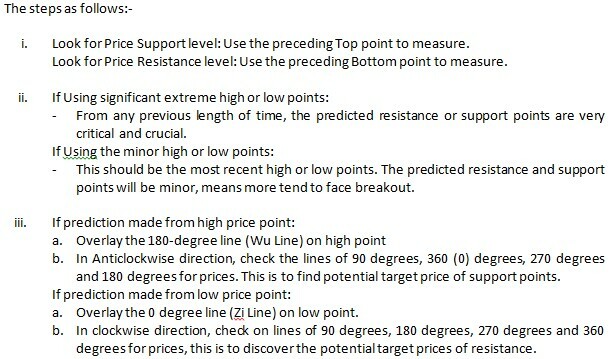 Technique 3 uses using preceding dates of high or low price points for prediction. In order to identify the future dates of potential turning point, extreme high and low points are used to forecast the dates. Time to Price uses dates of extreme high or low points to extrapolate future target price support and resistance range. Apparently, it seems incompatible to have Price vs Time mutually being used in making forecast. However, inalienable relationship does exist in Time vs Price. You should be to find out such statement is an absolute truth while practicing Technique 4 applying on trading/ investing. 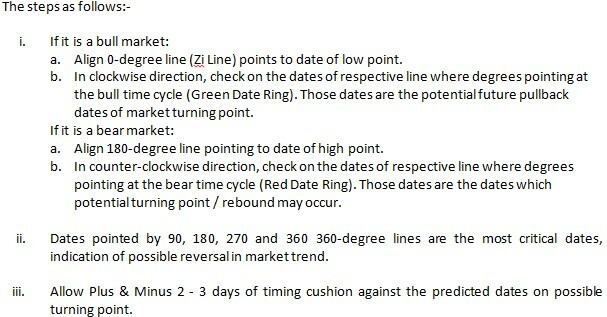 Price to Time technique uses previous extreme high point and low point (52 weeks high and low points) to forecast possible future dates of turning point. Technique 6 uses today’s (specific) date to predict the extreme high and low points, provides an effective speculative short-term target price. Technique 7 uses a week’s closing price to predict the following week extreme high point and low point. 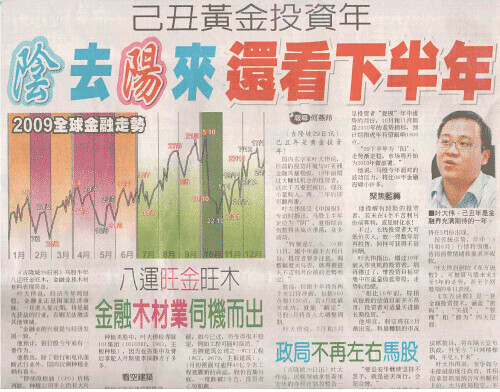 It is effective for speculative short-term target price. 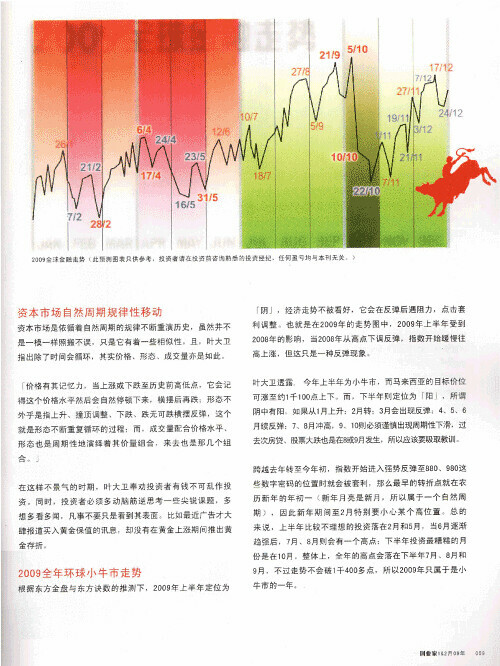 Technique 8 uses 24 solar terms (seasons) within the year which partitioned into 24 sections, through the oncoming of 24 solar terms intervals to predict the potential future rising resistance price and declining support price. Technique 9 uses the square of natural integer number (e.g. 1x1, 2x2, 3x3, 4x4 and so on) to forecast the future potential price resistance and support prices. The square of natural integer numbers are the important support and resistance price (number) in the market, like the crude oil price arriving at 121, 144 will meet the resistance. To project the rising or declining points, do look out for the turn when come across the square of natural integer numbers within its price range. If rose or fell 256 points, we have to look out the reverse movement in the short-term. The square of natural integer numbers can be used within the time frame of the rising price or declining price movement, so as to forecast the possible appearance of forecast transition, like rose for 49 days, 49 weeks, 49 months, and notice the possible appearance of trend turns. This technique is uses overlap of 8-lines with Square of Nine Numbers to predict future potential of the resistance and support prices. 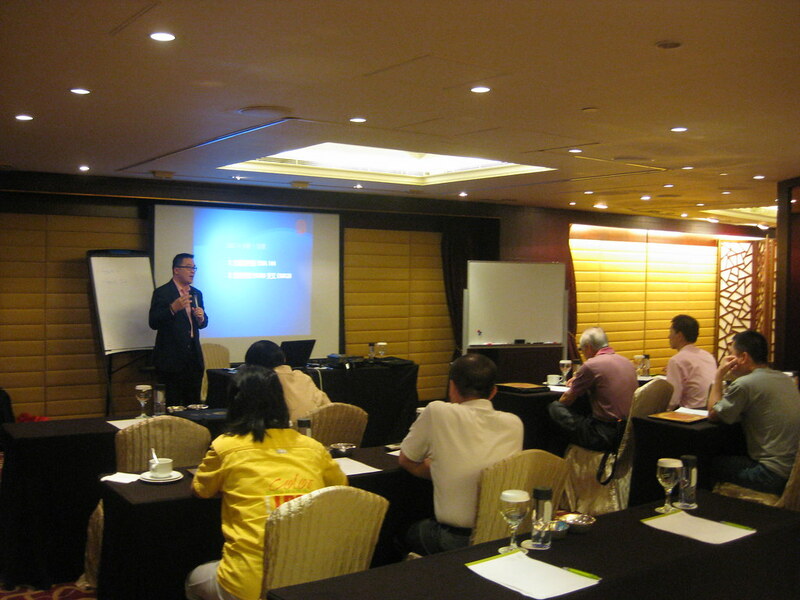 Technique 10 can be applied in conjunction with other techniques, consequently the numbers from Technique 9 and Technique 10 can be used as basis of final confirmation and judgment.